What’s Going to Happen with Group Lotus? It has been a tumultuous 3 year span for Group Lotus that began with Dany Bahar’s placement as the head of Group Lotus. The Evora was launched and then a few months later came the Paris Auto Show where Bahar introduced the world to 5 concept cars from Lotus and stated that these new concepts were the face and future of the “new” Lotus. At the same time Bahar more than implied that the new launched Evora was not a car that fit into the new Lotus. Consumers are not stupid; they could read Bahar’s tea leaves and Evora sales slowed. I was not alone in being baffled by Bahar’s lack of support for the Evora. His own business plan relied upon strong sales of the Evora to pay the interest on the loans he had received from the banks to help fund the 5 car plan. Yet, it seemed that Bahar was dooming his plan by shooting the Evora in the head. In the following year came “tie-ins” with Swizz Beatz, the Baldwin brothers and other celebrities. And the Lotus Motorsports group seemed to have a bottomless pit of monies to sponsor Renault F1, LeMans cars, ALMS cars, Indy cars, FIA Rallye teams and more. And there were huge parties before the Paris and Los Angeles shows with celebrity guests and private limos and more. Of course there was the row between Lotus-Renault F1 and Tony Fernandes Team Lotus F1 team. But, I’ll not go into that mess in this short article. Let’s move on, it has nearly been a year since Proton was purchased by DRB-HiCom and the Bahar party came to a violent halt! It did not take the folks at DRB-Hicom to realize they needed to get Bahar out, but they needed grounds which they found during an audit of Lotus. With Bahar sacked, DRB-HiCom stuck their man to run Group Lotus, a operations guy that could keep the lights on without breaking the bank. Any real news from Hethel was scarce, first it was “we are still doing due diligence”, next “we are working on a plan” and “We’ve been there twice and we like what we see”. But there was no real news about real plans to keep or divest Lotus from Proton. This gave way for rumors that DRB-Hicom was going to sell to VW, to GM, to Honda and even Caterham. A year has nearly passed and DRB-Hicom has Lotus on life support giving the Group just enough monies to keep the lights on and fill a few orders. 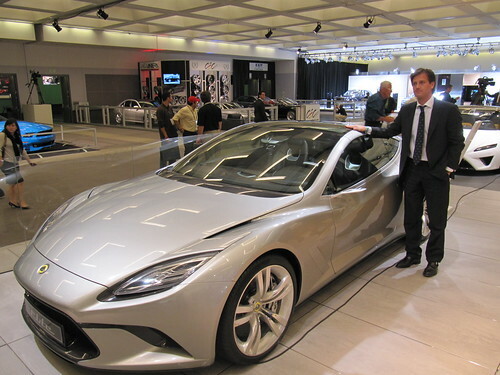 Witness the recent LA Auto Show, stark contrast to 2010 when Bahar debuted his 5 concept cars. This year Lotus Cars USA had absolutely no budget for the show; a show where 25-30% of the global production of sports are sold. The deafening silence from DRB-Hicom about Lotus and the trickle of monies to support the Group are telling. I don’t have any special information, but I think we can piece together what is going on. First I believe the entire Proton – DRB-Hicom deal was politically motivated. The sale of Proton and hence Lotus to DRB-Hicom was done because of the political pressures on the current Malaysian government to shed private interest and start showing some financial stability. It was the end of the 4th year of the current administration’s term and they needed to start righting the ship if they had any hopes of retaining power in the coming election cycle. But, why sell to DRB-Hicom? Afterall Hicom isn’t exactly the most obvious buyer, they are not in the business of selling and marketing cars. Again politics, Hicom is a contract company that has won and profited from large expensive government projects. Timing was critical for the Malaysian government; they needed sell Proton quickly, so they called in some Hicom chips. The sale was made at the beginning of the 5th year of the current term. The term for the Malaysian Parliament is 5 years. The previous election was held on March 8, 2008, so the current administration must hold an election before the end of the 5th year in office. There is no “set” schedule of when elections take place, only that they have to happen before the end of the 5th year. So, it is common practice for the administration to do house cleaning and give out “gifts” leading up to when they announce the elections. Elections can be announced with as little as 2 weeks’ notice. Why is Hicom just keeping Lotus in limbo? Why no public statement on what’s next for Lotus? I believe that a decision has been made by Hicom to dispose Lotus and do a massive restructuring of Proton. But that would entail the loss of jobs and exposing how much tax monies were lost by Proton. Not exactly what the current administration wants to see happen just before re- election. Thus, any news about the future of Lotus seems to hinge upon the Malaysian elections. Those elections have not been announced, but the end of 5 year term is March 7, 2013 (the last election was on March 8, 2008). If current administration loses, the Hicom will be free to dispose of Lotus and the newly elected leadership can claim they are fixing the sins of the old leadership. If the current administration wins then again Hicom can dump Lotus and the administration can continue knowing that they are in office for 5 more years and the electorate will have long forgotten about Hicom, Proton & Lotus by the next elections. Bottom-line, I don’t think we will hear anything from Hicom about the future of Lotus for a few more months. Watch for signs of “gifts” (like tax breaks and grants from the administration) as a signal that the election date will be announced and set. What will DRB-Hicom do, sell or invest? I believe the lack of information from Hicom says it all. There is no political or business downside to Hicom publically stating they like Lotus and are keeping and investing in Lotus. The lack of news is ever telling, Hicom has made a decision to divest Lotus but are holding off public announcements for the political reasons I previously stated. That Hicom is keeping Lotus on life- support is an indication that they are just waiting until it is politically prudent to make such an announcement. You could take the recent statements at face value and argue that it takes time to work things out with the banks and make right plans. Or, that the plans are set, but waiting for the elections to happen so the loans can be forgiven without huge political fallout. I believe such a scenario is a long shot. So sell as a whole or break up Group Lotus? I believe the VW rumors were half true. VW was interested but only in Lotus Engineering. But, Hicom understands that selling Lotus Engineering would mean Lotus Cars would be deeply devalued and Hicom would be unable to sell Lotus Cars as a standalone entity. Thus the VW deal never got anywhere. Hicom would then prefer to sell Group Lotus in whole and not break it up, but to what buyer? My bet is that a potential buyer will not be a large automotive maker like Honda, Toyota or GM. Instead the best scenario is a private buyer or smaller entity that is familiar with selling technology and knows how to be profitable in a niche markets. The biggest hurdle for this to happen is getting the banks to restructure the loans. Who might this private or smaller entity be? I don’t know, there have not been any rumors or news that puts anyone in talks with HiCom. However, I think this would be the best outcome for Group Lotus, even though there would not be the financial security of having a large auto maker’s ownership. In any case I think it’s unlikely we hear anything solid until at least March or April after the Malaysian elections. You must have a minimum of 10 track days experience. Passing without a point-by will be allowed on the long straights and some of the short straights. Passing in turns will be allowed with a point-by. You must have a minimum of 20 track days experience. Passing without a point-by will be allowed everywhere except through the corkscrew. 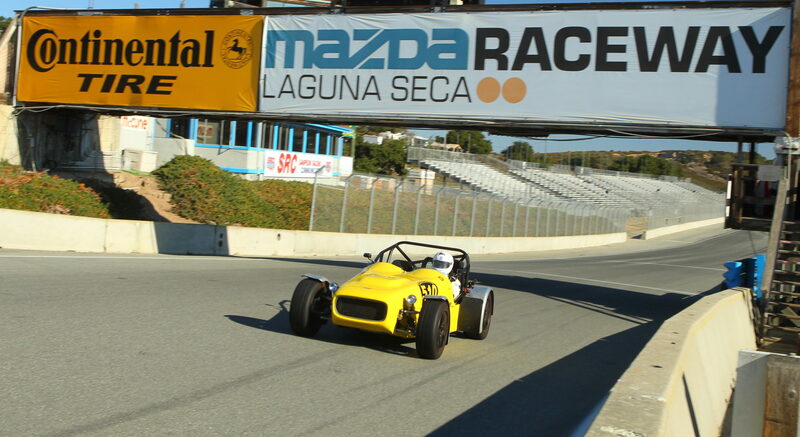 Laguna Seca enforces a strict sound limit of 92 db. This event will run rain or shine. There will be no money back cancellations. If you need to cancel and we can fill your spot by January 30th, then we will offer you a rain check for a future event. We will not conduct a tech inspection on your car. You are soley responsible for the safety of your car. There will be no formal instruction offered at this event. You are always encouraged to ask more experienced drivers for help, advice, ride-a-longs, etc. Click here to sign up using MotorsportsReg. We will close registration at 105 cars. We suggest that you enter early to ensure a spot. This event will certainly sell-out fast.